Lace jacket, vintage. Striped top, thrifted. Jeans, Gina Tricot. Cross, vintage. Shoes, Bronx. Bag, Miu Miu. 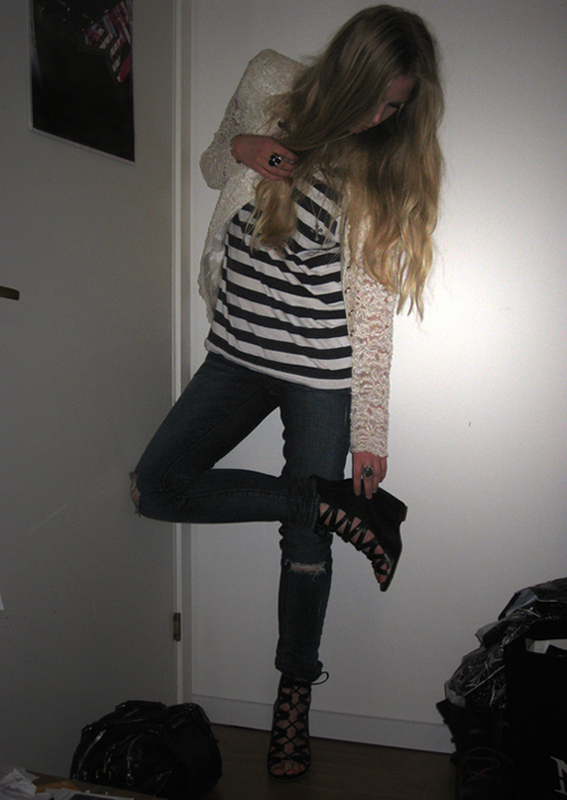 This entry was posted in Fashion, Outfit, Uncategorized and tagged Outfit by Carolina Engman. Bookmark the permalink. Wow that vintage lace is breathtaking! I’ve always loved a mix or textured cardigans and boyfriend tees! I’m in love with that vintage white lace jacket!!!!!! love this outfit…amazing jacket and shoes!! The shoes? The jacket? Fabulous. That’s a lovely lace jacket you got there! awesome outfit. I have been trying to find shoes like these and havent! The lace jacket is to die for! Amazing outfit!!! The lace jacket is incredible!! Elsker skoa dine, stilen din, håret ditt, og alt sammen. you are fabulous!! Those shoes are absolutely amazing!!! I’ve been seeing a lot of those, but not ones with the wedge. this couldn’t be any more amazing. wow, i absolutely love those shoes!!! wow that jacket is amazing! I love your outfit!!!!! I just want the bag. Thanks! amazing – have been a reader of your blog for months now and this is my first time commenting – always a fan of your outfits – love love love the lace jacket! Yowza! Lace and shoulder pads…. working it! it works on you and its fierce! your shoes are so bloody amazing! loving this look! That lace jacket is so cool! freaking amazing outfit, puss! Great look and love the blog too. I love the shoulders ? är du svensk/ are you swedish?